We couldn’t have visited Chester at a more opportune time. My eight-year-old son was studying Romans at school so Cheshire’s county town offered plenty of attractions on the history front. 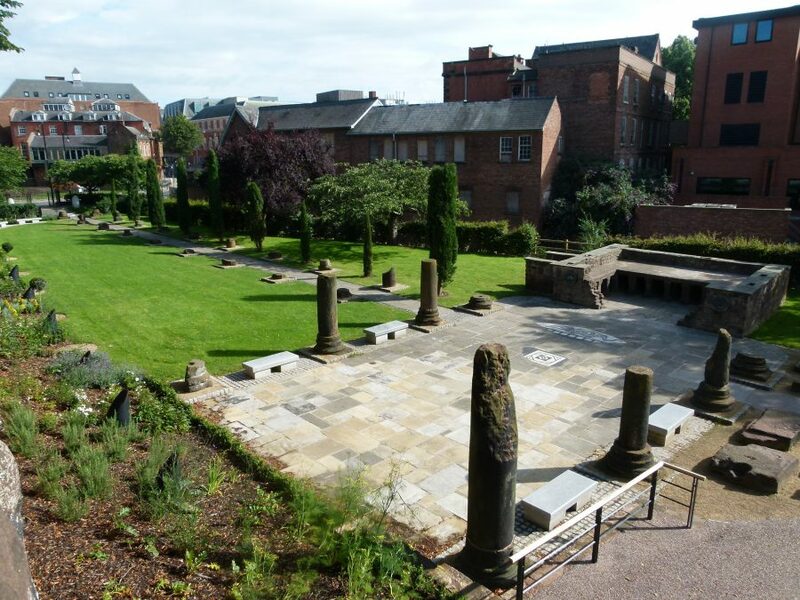 We walked along a stretch of the well-preserved City Walls, the most complete in Britain which date from the Roman occupation 2,000 years ago, before heading to the impressive amphitheatre. It’s so atmospheric, you can imagine this outdoor arena packed with 7,000 spectators enjoying a range of events, including gladiator fights. 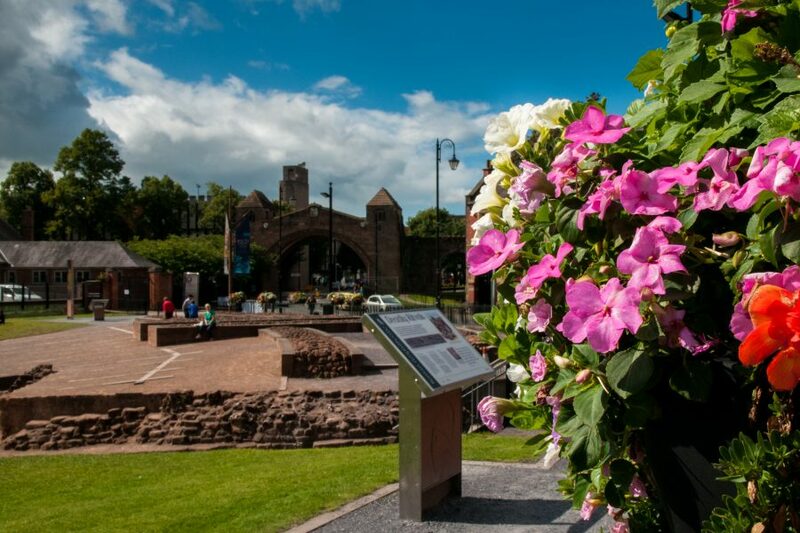 A slice of history is discovered around every corner of Chester’s streets. The city’s racecourse, reputedly the oldest in England, was once the site of a large Roman harbour while the cathedral has been reaching high into the air for 1,000 years. Founded as a Benedictine abbey in 1092, it’s been restyled over the centuries with today’s building dating back over 275 years. It’s free to enter, although donations are welcome. To fully appreciate this magnificent building, book yourself a “Cathedral at Height Tower Tour” (kids go free) and experience, among other delights, some of Europe’s finest medieval carvings. Chester is easy to explore on foot or, if you prefer, atop a vintage bus. The award-winning 1914 open-top bus has been voted the North West’s best small attraction of the year. Offering a unique way to see the city, a guide is on hand to tell you everything you need to know as you chug along. 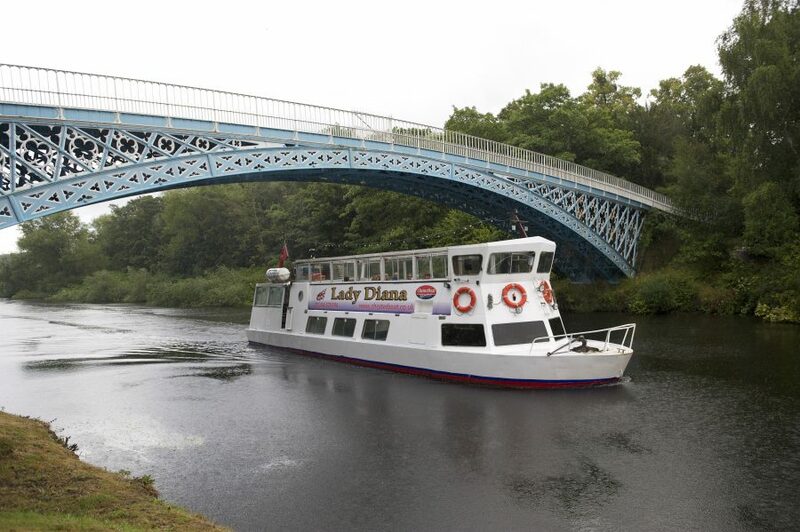 To experience a different aspect of the city, hop aboard one of ChesterBoat’s vessels and relax whilst drifting down the River Dee. Again, commentary is provided as you travel along the water. We enjoyed a pleasant half-hour trip. Yes, we could have opted for the longer cruise but this fitted nicely into our short break’s jampacked itinerary. Those with a little more time, however, might want to combine the cruise with a one-hour open-top guided bus tour. To make life nice and simple, the bus is waiting as soon as you step off the boat. Walking between the various attractions, we enjoyed a little retail therapy. 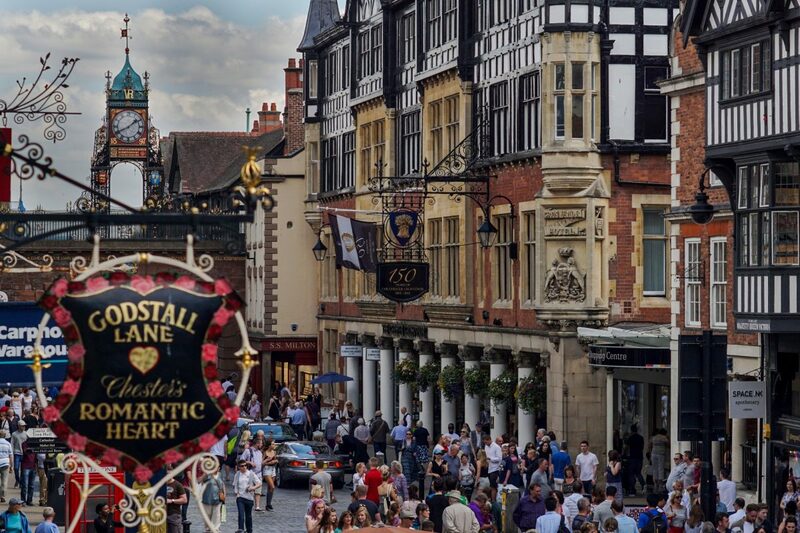 Since its birth as a bustling market town back in the Middle Ages, Chester has provided residents and visitors with everything needed on the shopping front. We enjoyed exploring Rows, where stores are not only at street level with steps transporting you to another collection of shops sheltered from the elements. It’s said that timbers from the shipwrecks of the Spanish Armada were used to strengthen the structures. You’ll find eateries to satisfy everyone’s tastebuds, from Michelin-starred restaurants to snack bars. We enjoyed dropping in at Mad Hatter’s Tea Room & Eatery in the famous Rows to enjoy a scrummy cake – although it took ages to decide between the many on offer. Expensive parking can often deter visitors from entering city centres so it was pleasing to see Chester offering reasonably priced options. 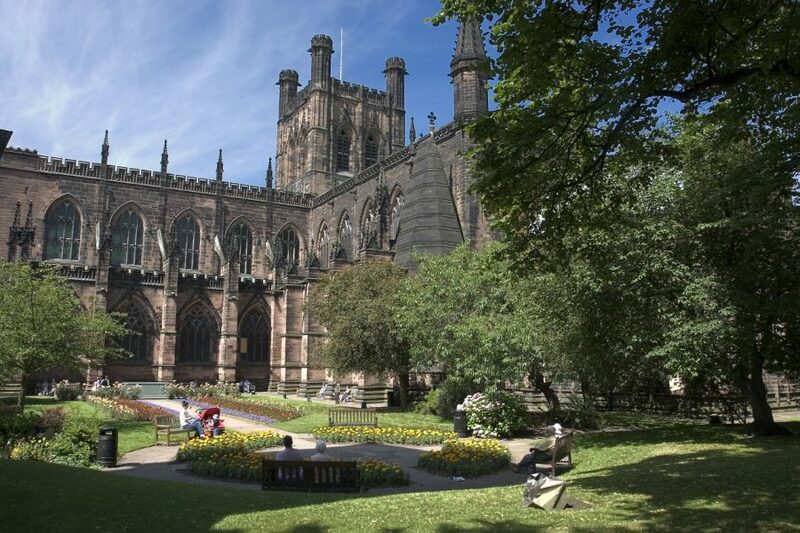 We parked alongside Chester Racecourse, minutes from the town centre, for just £5 all day. Outside the city, we visited Chester Zoo where over 12,500 animals live amid 110 acres of gardens and countryside. Like most zoos these days, Chester is heavily involved in protecting endangered species around the world: signs around the grounds indicate just how endangered many of the species are. We also liked the information boards dotted around revealing fascinating facts. Did you know, for example, that a cheetah can reach 60mph in just three seconds? There are plenty of places to buy food and drink or to sit and enjoy your own refreshments before continuing around the zoo – and, wow, what a lot of areas there are to explore. New for Sunner 2015 is “Islands”. Staff are recreating the tropical environments experienced on six Southeast Asian islands. Sadly, we visited before its opening but it’ll provide the perfect reason to return to this impressive zoo. Another notable attraction is Beeston Castle, which is looked after by English Heritage and situated 11 miles southeast of Chester. Topping a rocky crag, it’s among the most stunningly situated castles in England and affords visitors splendid views – especially if you make the effort and complete the steep climb to the top of the hill. Apparently, on a clear day you can see all the way from the Pennines to the Welsh mountains. It was a little hazy when we visited but I wouldn’t doubt the claim. There’s more to this site than the castle, including 40 acres of parkland to explore, the “Castle of the Rock” exhibition and small café. All in all, certainly worth a place on your itinerary. The county certainly has plenty to offer.